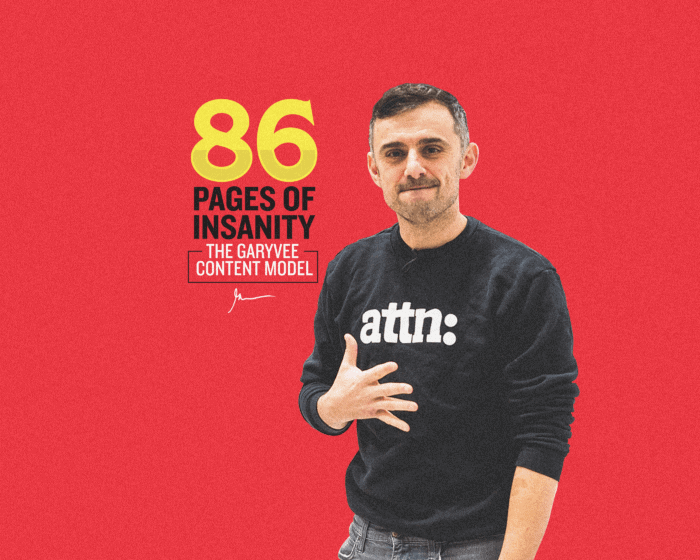 If you didn’t already catch my huge announcement in Episode 80 of DailyVee, I wanted to loop you in on VaynerTalent–VaynerMedia’s latest offering for established and emerging talent. One of the things I think is really good idea in business is to scratch your own itch and scale from there. Over the last year, I’ve gotten really serious about testing a thesis I have: the mobile device is becoming the television and the television is becoming the radio. 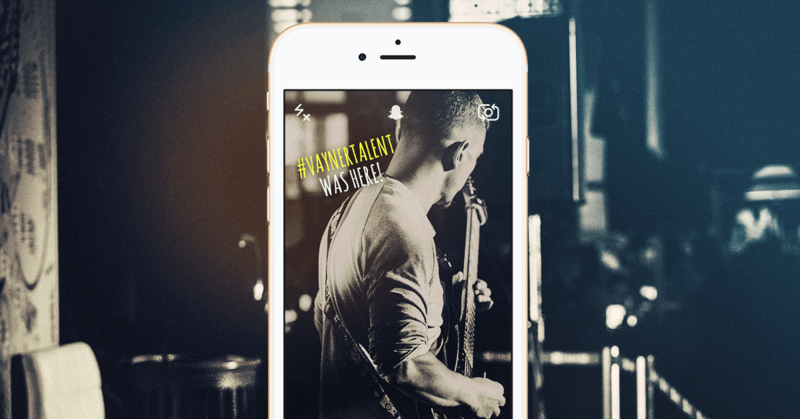 VaynerTalent is our move into a whitespace that we believe exists for people who are trying to build businesses around their personal brands and the stories they want to tell. 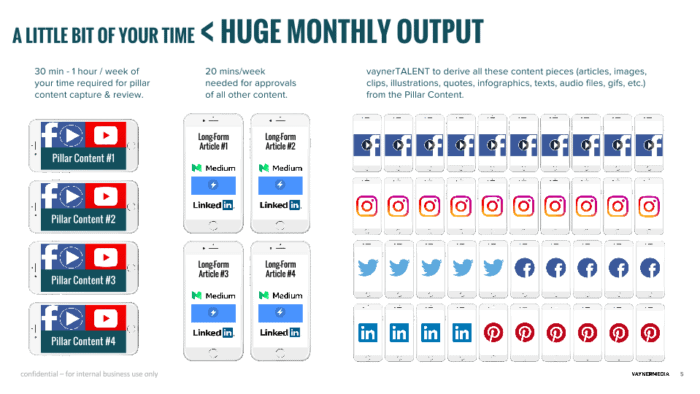 VaynerTalent is taking advantage of what we see as a fragmented marketplace between public relations, social media managers, and production companies. We achieve this by replicating what we have been able to do successfully around me and my personal brand. I have built a team around me who can attack those marketplace fragments by scaling my time and ability to produce and distribute content strategically. 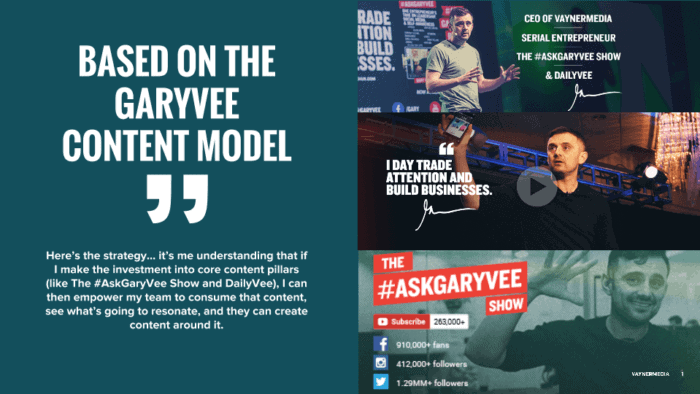 VaynerTalent is able to produce content at scale for established and emerging talent. 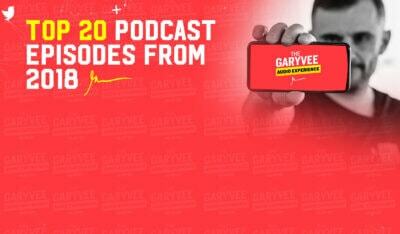 We create a meaningful piece of content, like a weekly show (think #AskGaryVee and DailyVee), as well as enormous amounts of social content for those clients who are extremely busy, but find the value in making a substantial investment in building their personal businesses. 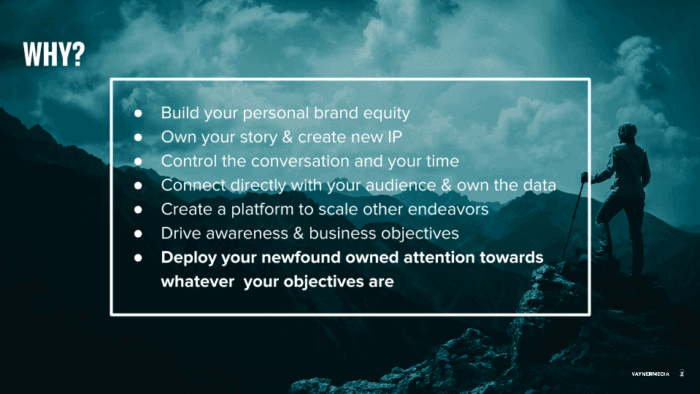 On VaynerTalent, we achieve this by replicating what we have been able to do successfully around me and my personal brand. 2. Why is now the right time for the market? I think there’s enough scale for individuals to go direct-to-consumer. You used to need a production company and a television network and agents and PR people to say “hello” to the world. That world has changed and we think we’ve got the right ingredients to help those individuals who want to take advantage of the opportunity. You used to need a production company and a television network and agents and PR people to say “hello” to the world. That world has changed. 3. How is this different from the representation, management, or PR that some talent already has? VaynerTalent does not eliminate the role of a talent agent or manager. And, while I don’t think it eliminates a PR person either, I do think it puts more pressure on traditional PR and “junior talent” in the social media realm to justify their value prop to a celebrity or emerging celebrity. I think it also goes after production companies as this is more of a modern day production company than anything else. We build a team that can scale time and the ability to produce and distribute content strategically. 4. Who should be using this product? Anybody who isn’t one of the 100 biggest stars today should take a very deep look at working with us because I think it brings a lot of value. After six months to one year of work, VaynerTalent could elevate the demand and size of the opportunities that the talent gets. For example: television shows, motion pictures, speaking fees, artist collaborations, and book deals. This product is also for the business-driven person who can afford the financial commitment (starting at $25k/month), has a talent or skill in a niche, and wants to become the biggest or one of the biggest names within that genre. VaynerTalent is able to produce content at scale for established and emerging talent starting with their pillar content. 5. 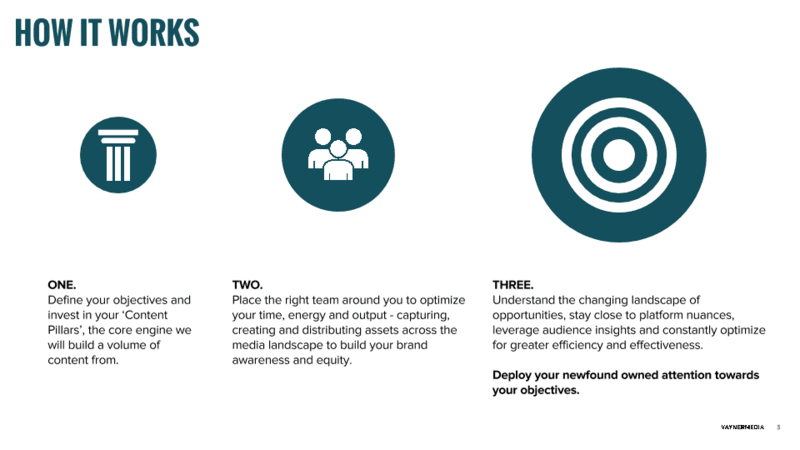 What can VaynerTalent clients expect to receive? Starting at $25k a month, our clients can expect a full 2017 blueprint on how to build awareness around their talents, passions, stories, and skills that creates endless business opportunities. Clients can also expect a signature piece of pillar content, like a podcast, web show, or a vlog, and enormous amounts of quality written, video, and image content combined with social growth strategies, analytics, and insights for the most relevant platforms and audiences. 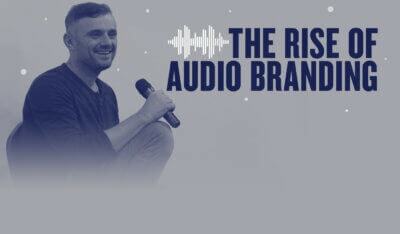 Over a two to three year period of time, this will build enormous leverage for much bigger financial upside in the ways to monetize a personality. This can include anything from selling merchandise to networking new business opportunities. 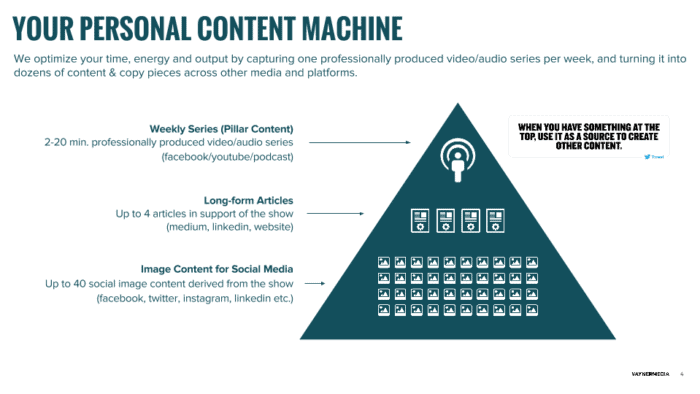 Clients can expect a signature piece of pillar content that, in turn, produces a huge monthly output of content that is optimized for relevant platforms. Download the info deck here.